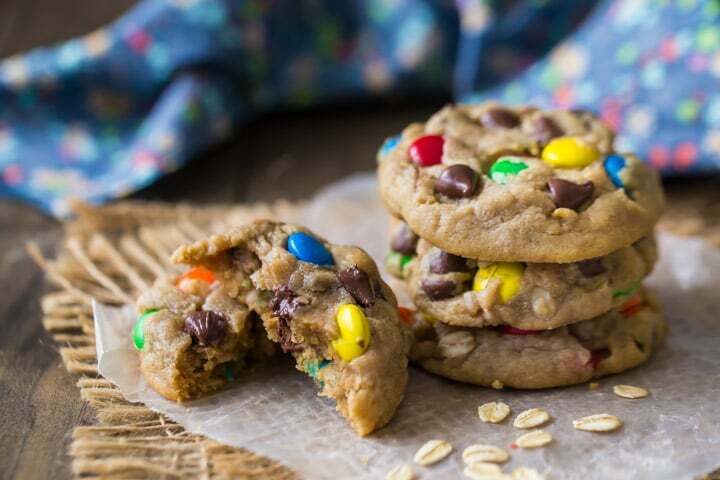 The ultimate after-school snack: Monster Cookies! Soft & tender, with peanut butter, oatmeal, chocolate chips, and m&m’s. We have a few more days left of summer vacation, but it’s winding down so fast! My oldest starts middle school on Friday. MIDDLE SCHOOL! I can’t believe it. He was 4 years old when I started blogging! Where has the time gone? I’ve made a lot of mistakes as a parent these last 7 years, I’m sure. But one thing I’ve always managed to get right is cookies. My kids know they can count on me for delicious, freshly baked cookies, warm from the oven, whenever the craving hits. And it hits pretty often! I’m known for my Soft Chocolate Chip Cookies, my Peanut Butter Cookies, and my Oatmeal Cookies. And of course Monster Cookies. Which are basically a combination of all of the above. Monster cookies are truly one of the best kinds of cookie. They have it all: peanut butter, oats, chocolate chips, and m&m’s. The best of all possible worlds! A couple of these soft monster cookies, along with a tall glass of milk, and all will be right with the world. There’s no better afternoon snack in all the land! ARE THESE MONSTER COOKIES SOFT? These cookies bake up SO soft and tender, and they stay that way! See below for more info on how to store them, but I will say that I have had my lazy moments, where I didn’t even bother putting them in an airtight container, and they STILL manage to be soft as can be. Even after sitting out unwrapped for a few days! If you like your cookies soft, this is the cookie recipe for you! You DO NOT need to chill the dough for this recipe. Mix up the batter and get them right into the oven. No waiting around! If your dough sits for a while before you get it baked up, you may notice that the dough will become stiffer, and the cookies will bake up thicker and kind of “puffy.” I like a chubby cookie as much as the next person, but I do like for them to puff up and then sink back down a little bit as they cool. So if you WANT to chill the dough, or if you’re looking for more of a make-ahead situation, just add a little less flour, scoop your dough balls a little larger, and bake them at 350 degrees instead of 375. All of these tricks will help your cookies to spread and flatten out a little more. 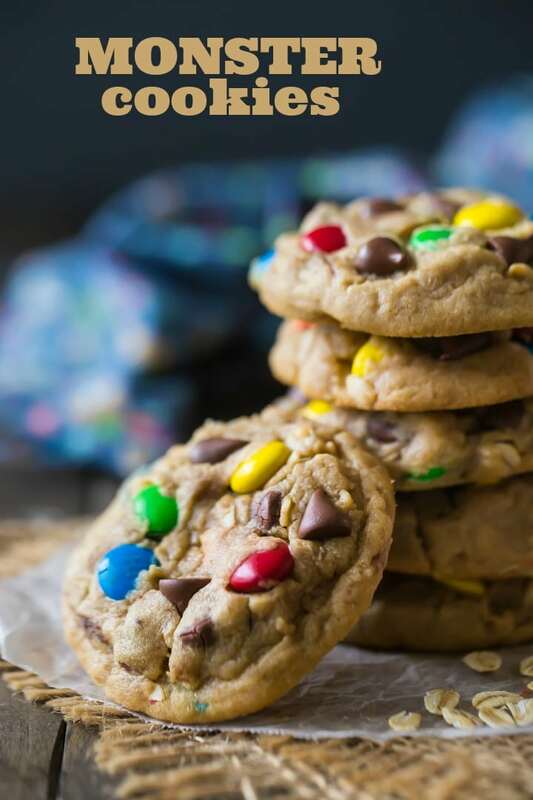 This monster cookie recipe is super-simple. You can have a big batch baked up in less than 30 minutes! Start by creaming the butter, peanut butter, brown sugar, and regular sugar together, until VERY pale and fluffy. The longer you beat, the more light and tender your cookies will come out. I recommend a full 3 to 5 minutes on medium-high speed. Then, mix in the egg, egg yolk, and vanilla, until well blended. The added egg yolk adds richness, and helps these monster cookies to bake up extra soft. Next you can add the flour, oats, cornstarch, baking soda and salt. You can read more about why I always call for cornstarch in my cookie recipes here: Vanilla Cut-Out Cookies. In a nutshell, it adds structure and lightness. Once the flour goes in, you want to be really careful not to overwork the dough. Mix it together until just barely combined. This way you’re not overdeveloping the glutens in the flour, which can make for a tough cookie. We want soft and tender! Last, in go the chocolate chips and m&m’s. I like to use dark chocolate m&m’s, but you can use whatever you like! I think pretzel m&m’s would be really good too- or peanut butter m&m’s! Just fold in the candies gently and then use a 1.5-tablespoon scoop to portion out balls of dough onto your baking sheet. HOW LONG DO MONSTER COOKIES TAKE TO BAKE? If you use a 1.5-tablespoon scoop, like I recommend above, these monster cookies should be done after about 9 minutes. But every oven is different, so you want to use your own judgement. You’ll know they’re done when they’re just barely beginning to turn golden around the edges. They should still be quite soft in the center. If you like your monster cookies soft, then it’s better to err on the side of underbaked. There will be some carry-over cooking as they cool, so keep that in mind! You’ll notice that these monster cookies are REALLY tender when they’re fresh from the oven. You almost can’t even get them off the cookie sheet without them falling apart. That’s ok! They will firm up quite a bit as they cool down. Just leave them on the baking sheet for a few minutes, then transfer them to a wire rack to cool completely. If you keep these monster cookies in an airtight container, they will stay soft for days! Scoop the dough onto a baking sheet, as noted above (as well as in the recipe card). Only you can place them on the sheet close together, because instead of baking them, you’ll be putting the tray into the freezer. Let them freeze until hard (this usually takes about 2 hours). Then, remove them from the tray and put them into a zip-top bag, and back into the freezer they go. Whenever that monster cookie craving strikes, just take out a few balls of dough and bake them according to the recipe instructions. You don’t even have to thaw the dough before baking! I hope you’ll give this monster cookie recipe a try! It’s one of my family’s absolute favorites. And it’s so perfect for kids! If you have little ones in your life, they will love you to bits for making them these monster cookies! The ultimate after-school snack: Monster Cookies! 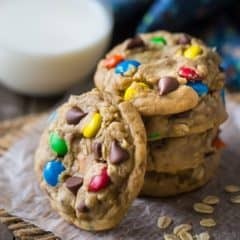 Soft & tender, with peanut butter, oatmeal, chocolate chips, and m&m's. In a large bowl with an electric mixer, cream the butter, peanut butter, brown sugar, and granulated sugar together until pale and fluffy (3 to 5 minutes on medium-high speed). Stir in the egg, egg yolk, and vanilla until well-blended (about 1 minute on medium speed). Add the flour, oats, cornstarch, baking soda, and salt, and mix in until incorporated (about 30 seconds to a minute on low speed). 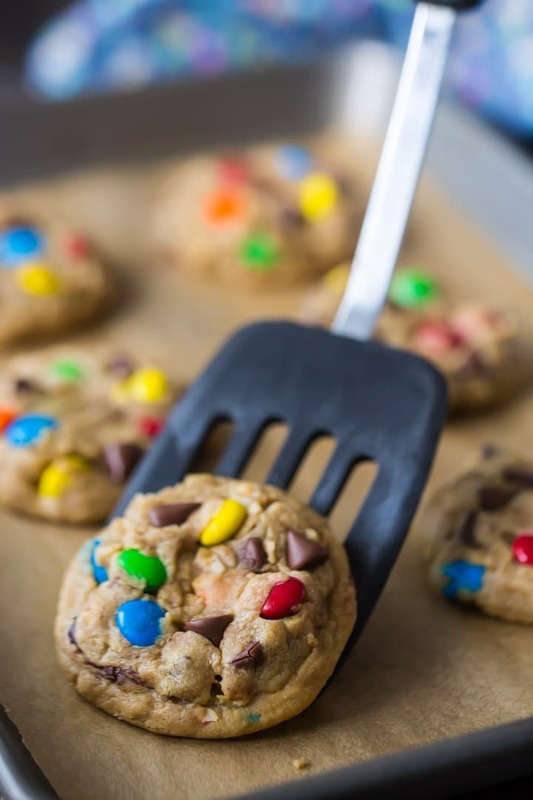 Stir in the chocolate chips and m&m's, and scoop 1.5-tablespoon balls onto the prepared baking sheets. Bake for 8 to 10 minutes, or until set around the edges, slightly golden on the bottoms, and still soft in the centers. Monster cookies are my favorite! Great recipe, delicious cookies. Thanks! So happy you liked them Kathleen! Thanks so much for the positive feedback! I’ve loved these since I was a kid! Your recipe is spot on! So great to hear that Liz! Thanks so much for the good feedback and the 5-star rating! Who doesnt love good monster cookie? These look delicious- and so many yummy ingredients! What a fun after-school treat! Kiddos will look forward to coming home to these! Wonderful recipe for Monster Cookies. Looking forward to trying some of the other recipes in your cookie baking series. So happy you liked it Pat! Thank you so much for the positive review! You can, but I don’t know if that’s necessary. It’s up to you and your time constraints. Good luck! Any high altitude adjustments for this recipe?? Hi I need to ask if you have a good recipe for a easy pie crust? 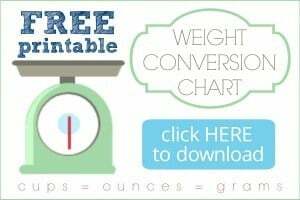 Absolutely Dienna- just use the search window at the top of the site!